A home page devoted to a record of my past, a dedication to art and writing in the present and future and various ideas I'd like to explore. I've decided to honor many of the creative people who continue to inspire me or who changed my thinking or feeling. ​I woke up in a bowling alley. A surprise party for me. I loved it. Or the care lavished on me that day. I have a special interest in new forms, in interarts and odd combinations of genres. I'd love to work with dance theater or new media directors or practitioners. I have a special place in my heart for Tanztheater Wuppertal and the late Pina Bausch. I feel that spirit alive in people like the director Katie Mitchell and the poet Anne Carson. Many others. On other parts of the site, I'll try to single out many of the guiding lights of my life and write a few lines about why their influence is meaningful to me.. .
A new type of poetry venue. 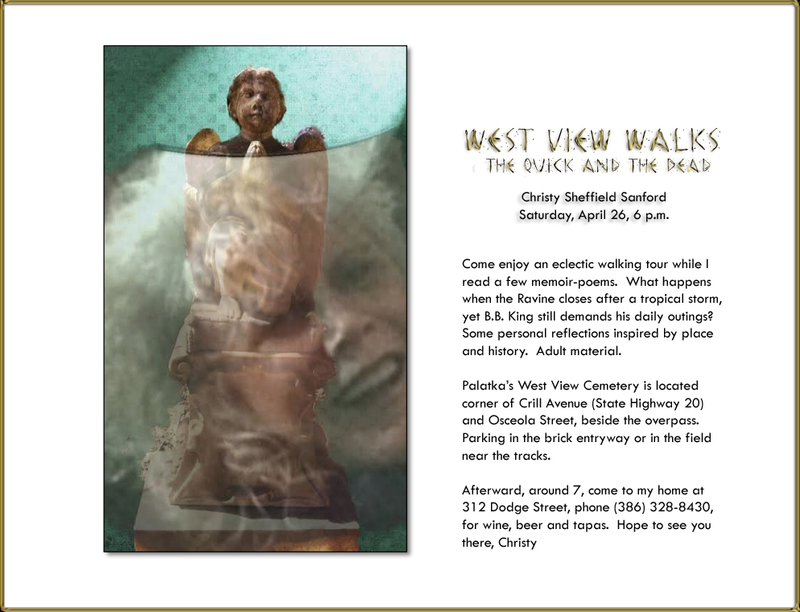 I read 10 poems stopping at various sites of inspiration in West View, a Historic cemetery where Mary Emily Boyd, the woman who saved the City from burning is buried. 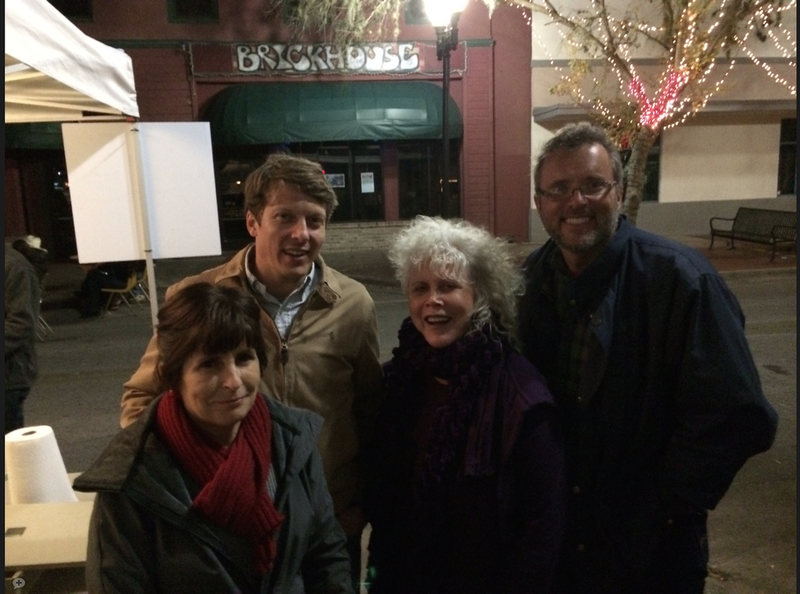 Artists must eat out occasionally and if possible on a St. Augustine first Friday Art Walk. A few members of Create! 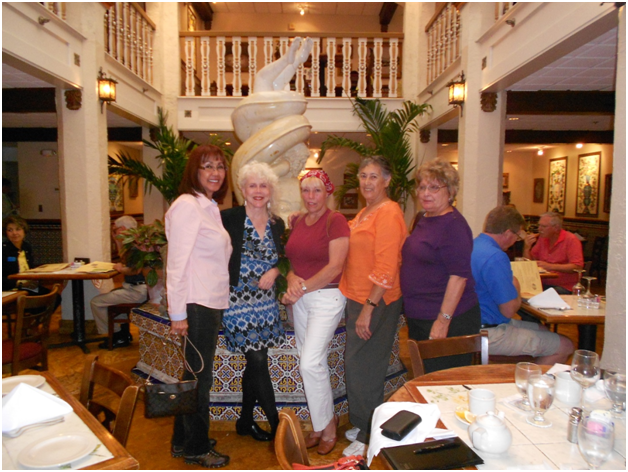 the Artists Guild of North Florida dining at the Columbian. Linda Tucker, me, King, Nelsy Conception and Terry Luke.Try the mussels. River Reflections: Our Town NEA Grant: Robbi Correa, Jonathan Griffith, me, Charles Rudd, missing Denise Aiken. We had just watched Florida School of the Arts students put on a light-water show on a river barge and on land with lighted sculptures. Bliss.